Quickly add a border and background colors to your Modern Editor design. Add a border easily on one of two ways: Either under the Styles section or selectively by using a Container. Option 1: Add a border around the entire design through the Stylesheet section. 1. Click on the Stylesheet tab from the edit content panel. 2. Under ESSENTIALS click on Background. 3. Click open Email Container. 4. Fill in details for border width, style and color. Click in Border Width to enter a width in pixels (Ex, 5px). This creates the border thickness. Click in the Border Style field to select an option such as dashed, dotted, or solid. Click in Border Color to enter your color code or select a color with the color picker tool. Option 2: Add a border around specific blocks using a Container block. 1. In your design, drag the Container block over to the preview panel. 2. Drag and drop blocks into the Container. The Container will act as a 'wrap' around all the blocks that make up your design. 3. Click on the Container from the preview panel. 4. 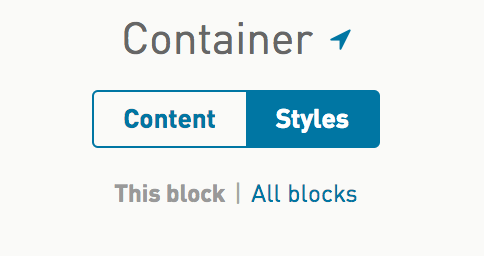 Click on the Container's STYLE tab. 5. Click open Block Container. 6. Fill in details for border width, style and color. 2. Under ESSENTIALS, click Backgrounds. 3. Click open the Body <body>. 4. Update the Background color. Click in Background Color to enter your color code or select a color with the color picker tool. Using the Global Styles you can adjust your background body so that your design floats in the center. In other words, the background color would flow to fill the whole space behind the design. 2. Update the Background color to the same color as your Container Background color.